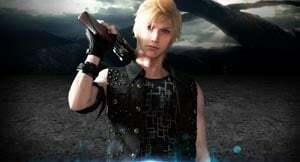 Prompto Argentum is a playable Character in Final Fantasy XV. Fast friends with Noctis since they met as teenagers, Prompto is a young man of common birth who finds himself out of his depth when tragedy befalls Lucis. Nevertheless, he strives to carry more than his own weight, lightening his companions' burdens as well as their spirits. Prompto is a Firearms specialist and the party photographer. His ranged approach is balanced by having the lowest HP of the party. He will be receiving a DLC that explores his story more, called Episode Prompto. "Nexuses that refine and boost your spells. Activate these nodes to improve your magical prowess." Actually, according to Brotherhood and in-game discussions, Prompto and Noctis met in elementary school, not as teenagers.